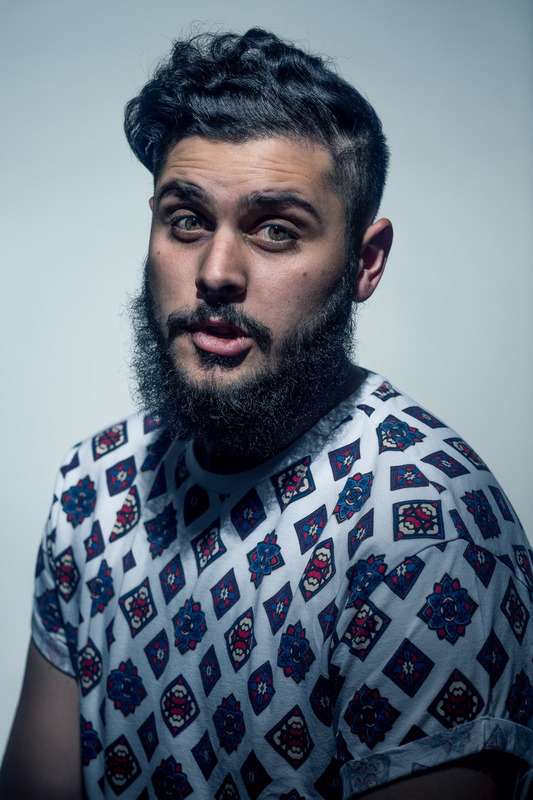 I met Simmi on what would be the final few portraits for my "Dudes with Beards" project. I was photographing his friend (Deen) for the project and he asked if he could bring Simmi along and I am glad he did. Simmi ended up contacting me a month or so later to talk about shooting some portraits for his upcoming one man show; "Make me Maaf" (or Jesuis Simmi, depending on the city). (v. t.) To give wholly; to make over without reservation; to resign. (v. t.) To give up resentment or claim to requital on account of (an offense or wrong); to remit the penalty of; to pardon; -- said in reference to the act forgiven. I'm pretty sure that Simmi mentioned that it means "apologise", so I am not too certain about the meaning, so take the above definition with a grain of salt. Moving on.. After some brainstorming and some pretty outlandish concepts on my behalf (from having him in a butchery amongst a bunch of pig carcassess, to looking longingly at a bacon burger - Simmi is Muslim - and even making a bomb vest from firecrackers) we set a date and shot some portraits. Simmi all along this process was always more than open to my ideas, no matter how crazy they sounded. I love when a client trusts my judgement. It makes me confident, which translates to better images at the end of the day, because they trust me to know what I am doing. I had fun creating these images with Simmi and I am happy to say we ended up making a really crappy bomb vest from firecrackers. He isn't afraid to challenge those kinds of stereotypes and I respect that immensely. Keep your eyes peeled for his one man show in the coming months and I hope to see you there.